Botetourt County's Courthouse reopened in 1975 following a devastating fire in 1970. A story about the fire, along with a picture of the old courthouse and a photo of the courthouse burning, may be viewed here. The county's records, fortunately, were in a fire-safe room-sized vault, and saved. As a result of this fire, the Virginia General Assembly in 1975 passed the Virginia Records Act, which mandates microfilming and otherwise archiving records so that they may be stored at a second site, the Library of Virginia in Richmond, for safekeeping. The county's courthouse is listed on the National Register of Historic Places. 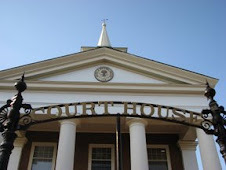 The Courthouse was rebuilt in the Greek Revival style, and this courthouse and the one before it are thought to follow plans initially created by Thomas Jefferson, though this is has not been proven to everyone's satisfaction. The original log courthouse was built in 1772 before being replaced around 1848 by the brick courthouse that burned. This is the courtroom as seen from the balcony. Note that the jury is seated around the judge's bench, and thus the defendants must face the jury when they are in the stand, which is the space at the far lower right of the photo.